Nigel Ogden runs A&R Print Solutions from the Northamptonshire office. As print brokers A&R Print Solutions use a network of the best "trade only" printers for a wide range of products plus a small amount of in-house digital printing. Buying in volume combined with knowing what machine is best for a particular job, means that A&R Print saves you, the customer, money. We select one of our quality verified printers to suit each specific job. All of our print partners are vetted in person and by reviewing their quality, equipment, finishing and of course cost, enables A&R Print to offer cost effective solutions to all your print requirements. Our customers have learned over many years to rely on A&R Print for our huge purchasing power and the ability to use one supplier for all their printing needs. Widely known in the local business community and further afield, A&R Print have learned through experience that customers need a fast response, an understanding ear, flexible service and obviously competitive prices. For new customers, we will carry out a free print audit on your previous 12 months print expenditure and would expect to save you at least 10% on that figure if you were to use our services. 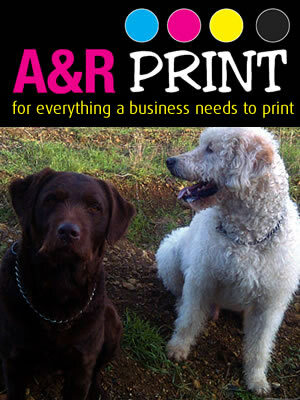 For a friendly chat about your printing needs contact A&R Print Solutions on 01933 461520.